I'm safely back home from my fantastic skiing holiday in Courchevel 1650. I'm tired but unbruised as I went through the whole holiday without falling over once! A few wobbles, but all were recovered from before I could hit the ground. I had lessons booked from Monday to Friday, but since we got in on Saturday, the Sunday was available to do some initial practicing. I was a little rusty as I've only skied once before and that was two years ago. But I soon remembered the basics and was able to ski down Mickey, the short (but steep at the top) beginners' slope without too much trouble. Unfortunately on the Monday, the lift operators all went on strike for the day and so there were no ski-lifts working anywhere in the Courchevel valley. This makes skiing quite hard. It also meant that my lesson had to be cancelled and so I was left to fend for myself. In the end, I really was very limited. Best I could manage was to walk to the top of Mickey and ski down. This was very tiring. And since the weather was very hot, I couldn't keep my jacket on for too long - at one point I was skiing in just my t-shirt. The weather the whole week was very hot (for a ski-resort, anyway!) and I never needed to wear more than a thin shirt and my jacket. Didn't even need a hat. This was especially nice given how bloody cold England had been for weeks previously. It was like going on a summer holiday. When the strike was resolved the next day, lessons were able to go ahead as planned. I felt that I made some really good progress in the week, though I still have trouble getting out of a snowplough when going round turns. But I can feel it coming. By the end of the week I was going fairly confidently down not only the green runs, but also quite a few of the blue ones too. The two hours of the final lesson were mostly on blues and I wouldn't say that I enjoyed it, but at least I wasn't scared to death like I had been several times on my last holiday! The instructor was excellent (I'd heartily recommend New Generation) and unusually was English. He'd been skiing for 22 years, since he was four years old - I can't imagine what that must be like. 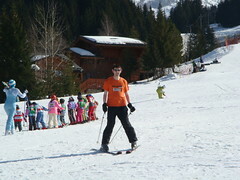 You see the lines of munchkins coming down the slopes but never really imagine that they grow up into ski-instructors. But they do, and good ones too.